There are the people who know that lying is damaging and dangerous not only to the person being lied to but also to the liar, and who will lie either not at all or very rarely. There are the people who don’t get that at ALL and who regard lying as an easy way out of a difficult situation, and often for these people, it’s quite frankly their go to fix for anything that goes wrong. And then there are the people who kind of get that lying is damaging, but they don’t much care about the damage, and actually they kind of like seeing the dramas unfold, so they go ahead and lie not even just to get out of trouble, but for fun. I’ve written in the past about truth and lying in general, and about why lying is SO incredibly dangerous, about how it unravels the tapestry of your life and then things start to unravel all over the place, about how throwing truth at a situation can open doors for you that you never imagined would ever open and can greatly improve a situation in ways that you might never have thought were possible. Like I said before, lies unravel the tapestry of your existence. There is a time and a place for them in the same way that there’s a time and a place for murder. But they carry with them grave consequences. However, if you’re reading this, you’re likely not the liar in the relationship, but the person being lied to. You might be debating whether to leave. You might be wondering if ANYTHING that you experienced with the other person was ever real. There are other people and other resources who can offer you other strategies, but my specialty is helping you to ground. So here’s what I suggest: make a list. List the things that you know are true. Almost no liar will lie to you about everything, and even if they do, some things they can’t lie about: who they are as a person, how they act in the world, whether they approach their day with kindness or with fierceness or with fear or with angst. Things like that. How they do their work. How they live. How they operate. There will be some things that you know are true. There will be some ways in which they are trustworthy and some ways in which they are not. Grounding is important because lying erodes your sense of personal safety and security. Just as it unravels the tapestry of your life, it also throws off your personal compass in that life. For example, two of the most common reasons for lying in a relationship are infidelity and money issues. And these are highly charged issues that can make the person who is being lied to feel as though the rug was just pulled out from under them, or worse, as if their house just caved in. As if they had just experienced an earthquake. How does this person treat you? Do you feel physically safe around this person? Do you look forward to spending time with this person? Or do you dread interacting with this person? Is this person kind and gentle with you? How does this person treat others? Is this person polite? Is this person disrespectful and patronizing even in day to day language? How does this person treat children? If this person is a parent, what have you observed about their parenting practices? How does this person treat their family of origin? How does this person treat your family pet? How does this person approach their day? How does this person operate at work? Does this person observe any ethical standards in a working environment that you have or have not observed in your own interactions with them? What are this person’s personal basic values that you have observed, that are evident in their actions? What does this person NEVER do, no matter what? What does this person ALWAYS do, no matter what? Does this person regard themselves as a person of integrity? Even if that belief is hypocritical (because lying isn’t very indicative of integrity, IMO), this information still offers an angle for considering the situation. What are the power dynamics in your relationship with this person? What are your resources for reacting? For example, if you are considering leaving someone you live with, what is your specific plan and what steps would you need to take to make that possible? What self-care things do you need to do for yourself to help yourself to get through this? Do you need space (physically or emotionally)? Do you need to go see a therapist? Do you need to focus on nourishing other parts of your life that are important to you? Whether you choose to continue the relationship or not, self-care should be a priority, if only because you need to have your feet on the ground in order to operate in the world. It’s okay to choose not to decide anything right now. It’s okay to say, I’m setting this to one side and focusing on taking good care of myself while I let things settle. Because the bigger the lie, the bigger the shock to your system–so you may need to prioritize emotional first aid. You may also need to prioritize the stuff you have to do on a day to day level–but that also means prioritizing emotional first aid. You won’t be able to operate and go to work and take care of your kids unless you have attended to your own well being. Your emotional safety MATTERS. Tarot readers can and do make mistakes. Even if your reader is 100% accurate and correct, you won’t be in a state of mind to hear anything they say. Even if you can be sure that tarot’s version of the truth is absolutely correct, and even if you are in a state of mind to hear the truth, what are you actually going to do with that information right now? What are you going to do with that information that will make the situation better? What are you going to do that will make you feel better? The Seven of Swords is a card that I often think of when I think about how lies might appear in the tarot, even though there are also many other reasons why this card might come up. 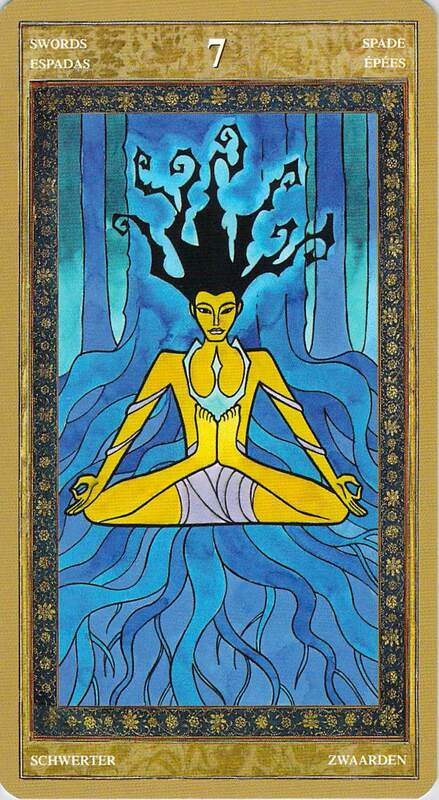 But I especially like this version of the card, from the Yoga Tarot, because it emphasizes some of the things you might especially need for healing: roots, grounding, meditation. I’d actually recommend going to see a therapist before you go to see a tarot reader about something like this, especially if the lie(s) was something very serious. But if you do go to see a reader in these circumstances, instead of asking a bunch of questions about the lie, consider asking some of the questions that I listed as a way to ground (what are this person’s basic values? what are your resources for reacting? etc. ), above. You don’t NEED tarot to answer those, because you already know the answers, but tarot may help you to tap into what you already know or may draw your attention to certain aspects of what you know. In other words, this isn’t the time to focus on the lies that were told to you. You already know all about them. If you go to see a tarot reader right after being lied to, focus on what’s important. Focus on taking good care of yourself. Work on getting the ground back under your feet. The more I let FICTION into my life, the more false or wrong I feel I fall into…meaning I was wrong and I was shown my wrong. I feel more like resonating with TRUTH and correct things spill out of my being when I ELIMINATE ALL FICTION. Beautiful article. The advice to seek therapy or counseling before a reading is a message we all need to hear.